Including Ffrwd Fawr - Nant Feinion. From Cardiff, take the A470 to Rhayader. From Rhayader, turn right onto the B4518 just after the wonky junction with the clock tower in the town centre, heading away from the Elan Valley. After just over 9 miles, take an unsigned road to the right opposite a private driveway (the second proper road to the right after the ridiculous Tylwch village hairpin bend, about 0.7 miles after the village). After 0.7 miles, at the first cross-roads, turn right. 1.5 miles later, as the road turns hard right with a stupendous view of the valley in front, park in a gravel layby close to the Llidiartywaen Community Centre. SO 0007 8170. It is important to note that the waterfall is exceptionally difficult to reach, and is probably best left alone. However, expert visitors who wish to visit the waterfall may choose to follow this route. Fallen trees may block the route, and although it may be tempting to use something to cut through their branches, this is a SSSI; even fallen trees are protected. Undergrowth can be very thick in summer, so visits are perhaps best in winter. The waterfall also lies on private land, although the local farm is derelict. Visitors should seek permission from the current landowner as needed. The upper falls may be visible through the trees in winter, from fields near Glyndŵr's Way, but the main waterfall can only be properly seen from the stream bed. Although the Cwm Diffwys valley can be seen from the start of the walk, the main waterfall is obscured by trees at all times of year. From the community centre, take the small lane that leads off to the left on the main road's corner. After 200 metres, take a dirt track on the right, signposted as Glyndŵr's Way. After 550 metres, in a wooded section of the track, take an overgrown track that branches off to the right. It turns a sharp bend to the right shortly afterwards, to run along the top edge of a field. The field may be very heavily overgrown and the track may be difficult to see. As the field reaches a small stream, the track turns left to follow the stream down towards the main valley's stream; Nant Feinion. When a path cuts across to ford the small stream, turn right on that path and cross the stream - during my visit, the rotting remains of a lorry trailer (looking like a collapsed portable building) could be seen on the other side of the stream. The main Nant Feinion stream should now be on your left, and you should be facing upstream. Shortly after the lorry trailer, the path splits into a track that stays to the right of the Nant Feinion stream, and a path continuing ahead that fords the stream and enters a small field. Ignore both. Instead, ford the stream to the left of the main ford, where there is a gateway into a field to the left of the other one. Continue in roughly the same direction, keeping the hedgerow separating the fields on your right. There is a track here, but it may be heavily overgrown. It soon reaches a small stream and a much better worn path heads upstream to the left. This is the Cwm Diffwys valley. Take the path upstream to the left. It soon splits. The path ahead-left only ascends to the ridge above the stream, missing the waterfalls. You need to follow the stream upstream to see the waterfalls, and the sooner you do this, the less undergrowth you will have to contend with in order to reach it, so take the path to the right instead. When it fords the stream, head upstream along the stream bed instead. The valley grows taller and steeper, with the sides eventually becoming almost impossible to ascend. At each little cascade, climb the cascade, or carefully ascend the bank in order to get upstream. (At one point, the stream turns abruptly to the right in a relatively open section with a very large, exposed rock on the left - the ascending path reaches the ridge-top at the top of the slopes above the rock to the left.) 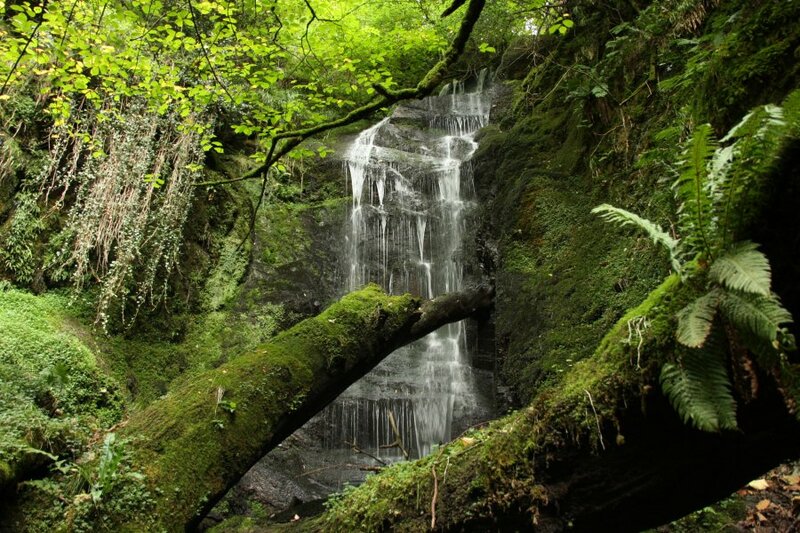 The main waterfall is guarded by a 5 metre waterfall before it, which needs to be ascended to get the best view. Now for the really difficult part; getting above the main waterfall. This is not really needed - you could just turn back, but you will miss out on the best views. The best approach is to head back downstream until you can locate a place where you can ascend the bank to regain the path that climbed up the ridge (it will be on the right when heading downstream - go all the way back to the path if you need to, but I would suggest looking above the exposed-rock-on-the-abrupt-turn mentioned earlier). The banks around the waterfall itself are very friable, and are likely to fall apart under you if you attempt to ascend them. At the top of the ascending path, it turns sharp left into a field, with a tributary stream beginning on its right side. Instead of following the bend to the left, continue ahead into a field, where there is a smaller field separating you from the main Cwm Diffwys valley. Keep that smaller field on your right, passing through the various hedgerows until you enter another small field at the edge of the valley. The main waterfall lies under this field. At the other end of this field is a house and stable, and from their garden (you asked for permission, right?) two smaller upper waterfalls may be glimpsed through the trees. I do not recommend attempting to descend to them. Follow the driveway out from the house to reach the main track; part of Glyndŵr's Way. Turn left on the track, and enjoy the views. In the distance on the left is the Pumlumon mountain range. In the distance ahead-left is the Aranau range. As the track starts to descend, the Berwyn range appears in the distance ahead-right. Keep left when the track splits, and follow it as it descends increasingly steeply down into the bottom of the valley. Just before the track crosses the stream, take a side track to the left and follow it upstream. Shortly after it crosses a ford/footbridge, the track enters a field on the right. Continue on the path ahead instead, which then swings right to enter the same field at a gate. Climb steeply up ahead-left to another gate, which gains a track. Turn left on the track, and climb all the way back up to the road. Turn left to get back to the community centre, and the start of the walk. KML files can be opened in Google Earth, Google Maps, GPX Viewer, and some other mapping services. Whilst every care has been taken in the compilation of this description, neither the author nor his fellow walkers can accept responsibility for loss or injury arising from any errors, omissions or inaccuracies in this description. This description is intended as a guide only, and you should select a route to suit your own abilities, at your own discretion. Ability requirements are a guide only. Route maps are approximated. You follow this description at your own risk.